Our e-book about global rabbit breeds, Domestic Rabbit Breeds, a Kaleidoscope of Variety, contains comprehensive descriptions and many photos of 50 breeds of rabbits in the USA, plus domestic rabbit breeds in the UK, NZ, and around the world. ...is Raising-Rabbits' exciting new addition to the World of Raising Rabbits e-books! Domestic Rabbit Breeds will help answer your questions about which breed or breeds will best serve your needs. That is a lot of diversity! 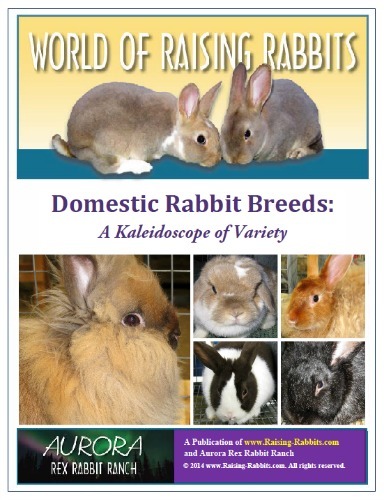 The 206-page Domestic Rabbit Breeds: A Kaleidoscope of Variety will share all of it with you. But, Domestic Rabbit Breeds is much more than just a catalog of all breeds of rabbits. Besides the ton of info about all breeds of rabbits, you'll also learn about their functions and uses. We've provided a synopsis of some of this info here on the website, but we’ve added many more full-size photos to the full set of rabbit breed information, organizing comprehensive rabbit breed information (and more) into this useful and convenient e-book. Save yourself the time and headache! Purchase the e-book that contains ALL the info you need. Do you have a mystery rabbit? Have you ever wondered, "What breed is my rabbit?" This e-book can help to shed light on the possible breeds that make up your pet mystery rabbit. It is not always possible to tell, of course. But, if you can’t match your mystery rabbit to a known, purebred rabbit breed, you may be able to spot similarities in various other breeds of rabbits. We will show you the process to use in order to figure out the lineage of your unknown rabbit. It would be fun and rewarding to finally know what breed or breeds make up Fluffy! But if you still can’t figure it out, then likely no one else can either. At least you’ll know you gave it your best shot and can lay the quest to rest. 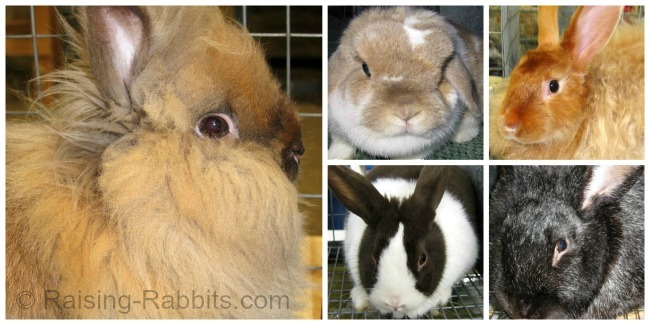 Wondering which rabbit breed is the best one for you? This e-book will provide the information you need to help you answer that question. You likely already know what you need in a rabbit. If it will be a pet, you have your preferences. Then again, maybe you don’t know the wonderful variety that is available! Do you need a dual purpose rabbit for your homestead? From this e-book you’ll get a good feel for the capabilities and the appearance of each rabbit breed, so you’ll be able to make an informed decision on which breed will best fit your needs. You may be surprised at how many rabbit fanciers over the years couldn’t find just the rabbit they were looking for, so they decided to create what they needed. If necessary, why not you? After reading this e-book and researching the various already existing breeds, you may find that someone else has already envisioned and created the perfect rabbit breed that YOU had in mind. All the better if there exists a breed that is already just right for your purposes. But if not, surely you’ll find a particular breed (or breeds) that will make an excellent starting point for your brainchild. Additionally, we included a short section on the ethics of using rabbits. In case there is any question, it helps to understand the necessity and survival instinct that drove humanity to domesticate their herds, including rabbits, over many millennia. This is why so many breeds developed in the first place.